"Gardone is a pretty and well kept town with some very nice hotels"
Gardone is very pleasing to the eye and is well manicured and pretty. The abundance of flowers here make it very colourful, especially down by the lake. 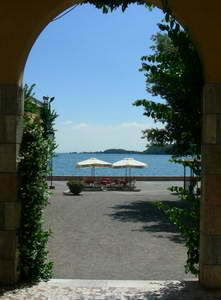 There are a variety of really nice hotels here and it is a very popular lakeside town. 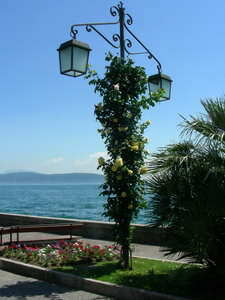 It is also well known for its botanical gardens. The lakefront here is very pretty. It is basically a pedestrian area with lots of seats and ornate lamposts with hotels and restaurants behind. 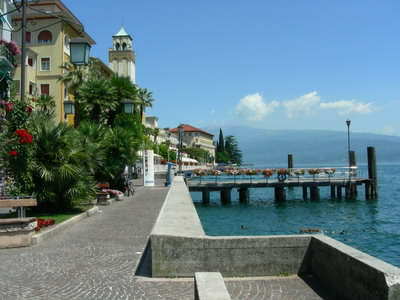 There isn't really any significant beaches or port area close to the town centre, so the town tends to be more popular for lakeside strolls or watching the world go by. This is probably why it is often favoured by the some of the older generations who really appreciate the lovely surroundings. It is less suited for those who want an active holiday, and for young families there may be less to do than in some towns. 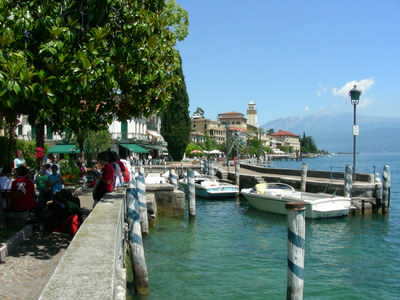 However, if you have a car, it is a short drive to some beaches and you can always hop on a boat from here to most towns on Lake Garda. The roads, though, can get quite busy and it is another place where parking can be hard to find. Having the hills and moutains behind means you can also find accommodation a little away from the lake that offer great views over water. As with a lot of towns here, it is quite a long thin shape in order to maximise the lake frontage. The town has a elegant and cultured appeal which many will find very attractive. Click here to go from Gardone to the home page.